The first ever Moskovskaya® line extension in brand history – Moskovskaya® Silver – has been produced by Latvijas Balzams, part of Amber Beverage Group. The traditional recipe of Moskovskaya® has been enhanced with new purification technology using charcoal and silver purification before being filtered four times. This technological process ensures the most pristine taste and smoothness in Moskovskaya® Silver. 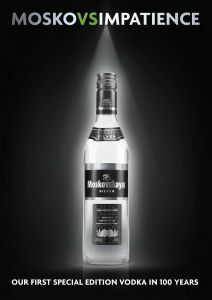 “Moskovskaya® Vodka is a well-recognized international brand with a global footprint. We believe that Moskovskaya® Silver edition will enhance Moskovskaya® market presence and attract a broader range of consumers to this unique brand,” said Seymour Ferreira, CEO of Amber Beverage Group. Moskovskaya® Silver edition comes in premium packaging with a new label design and closure, while retaining the recognizable bottle shape of Moskovskaya® Vodka. Moskovskaya® Silver will be available in 50cl and 70cl bottles at the launch. Distribution will start with the three Baltic countries in May, to be followed by a launch in other markets later this year. The rich history of Moskovskaya® Vodka, one of most long-standing vodka brands in the market, is closely linked to vodka-making traditions of Latvijas Balzams production facility in Riga, Latvia. The facility was established in 1900 as one of the first warehouses and production facilities of the Russian Empire Spirits Monopoly. For more than a century it has defended the finest traditions of quality, delivering vodka satisfaction in its most authentic form.